1-ingredient raw vegan banana ice cream, or nice cream is quite possibly one of the greatest inventions. All you need is some frozen bananas, and that’s it. Who would have thought just by blending up frozen bananas, you can make a creamy delicious ice cream! It’s quite ingenious. On top of it, it’s very good and good for you! Bananas are high in potassium, vitamin B6 and C, and minerals such as magnesium, manganese, and iron. It’s truly guilt-free and “loves you back” kind of ice cream. If you like bananas but aren’t sure how you would like an ice cream made just from bananas, don’t worry. It actually doesn’t have a strong banana taste as much as you’d think it would. It’s there, but more in the back ground and not in your face, so you can enjoy it as a creamy banana flavored soft serve. Let’s get right into the easy-peasy instructions. Since the only ingredient in this recipe is bananas, it’s crucial to use fully ripe bananas. Now, there is some misconception about when a banana is ripe. 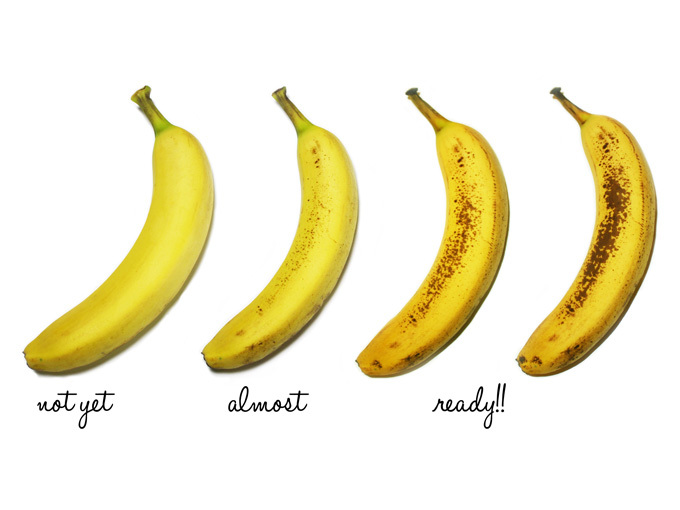 Although yellow, spotless bananas are pretty and more appealing to the eye, they are not ripe enough! When the bananas are fully ripe, brown spots appear all over. These spots are called sugar spots. Unripe bananas contain resistant starch which does not digest until it reaches the colon. During the ripening process, this resistant starch gets converted to simple sugars. The sugar spots are an indication that the resistant starches are turning into simple sugar. Resistant starch can cause ingestion, gas, and bloating, but simple sugars are easy to digest. Ripe bananas with brown spots contain the most antioxidants compared to green or yellow bananas. The increase in sugar is great for recipes, as you don’t need to add extra sweetener and only rely on the banana’s natural sweetness. So ripening bananas are great for a boost in nutrition and also for the sweetness. 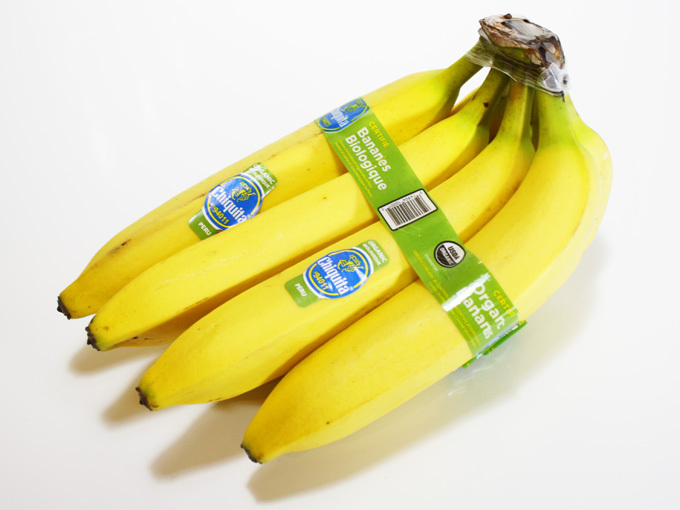 Once your bananas ripen, peel them and put them in a large zip-lock bag. Seal the bag tight with as little air as possible. Stick it in the freezer and freeze it overnight. Banana bunches ripen all at once, so for some people it can be difficult to eat them all before they go bad. If you want to slow down the ripening process, just separate the bananas. I personally like to dedicate a couple of banana bunches just for freezing, and freeze them all at the same time. That way, you can have it ready anytime for smoothies and banana ice creams. 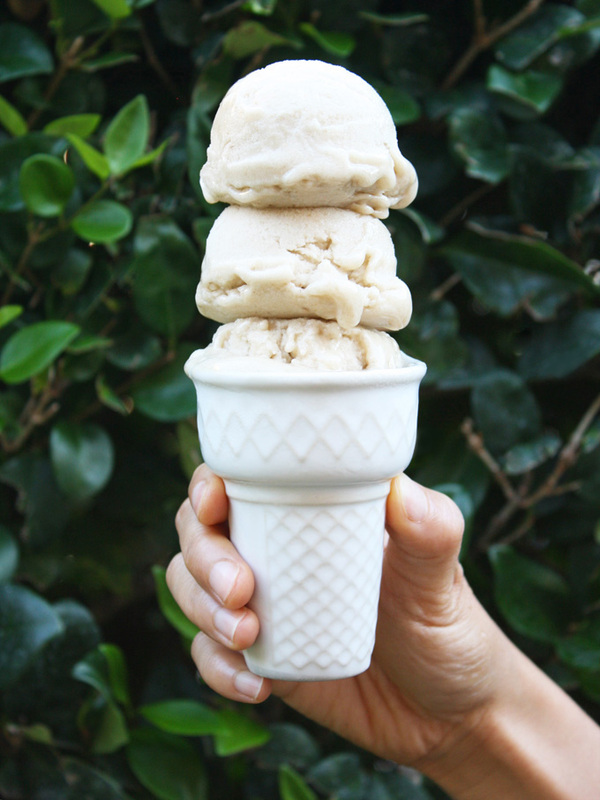 When your bananas are frozen all the way, it’s time to whip up the banana ice cream! 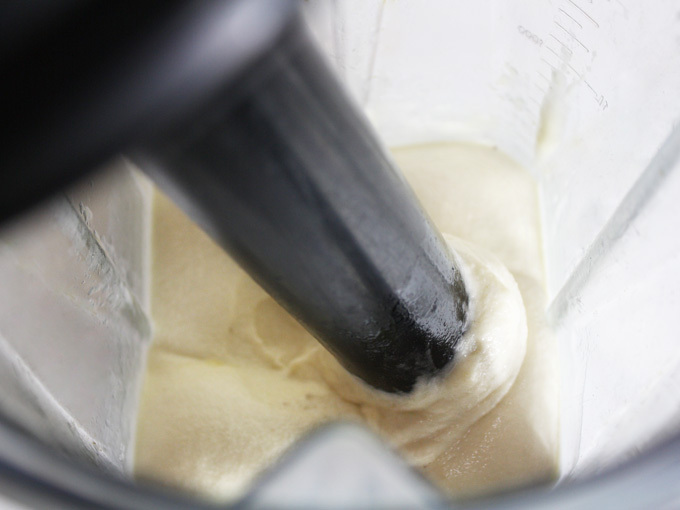 Simply put some frozen bananas in the blender, and blend until it becomes a smooth creamy texture, like a soft serve. If you have a Vitamix, use the handy dandy tamper to jam the bananas into the blade to help it blend. If you don’t have a high speed blender like Vitamix or Blendtec, you can use the food processor instead. But you should cut up the bananas into smaller pieces before you freeze them, to make it easier for the food processor. 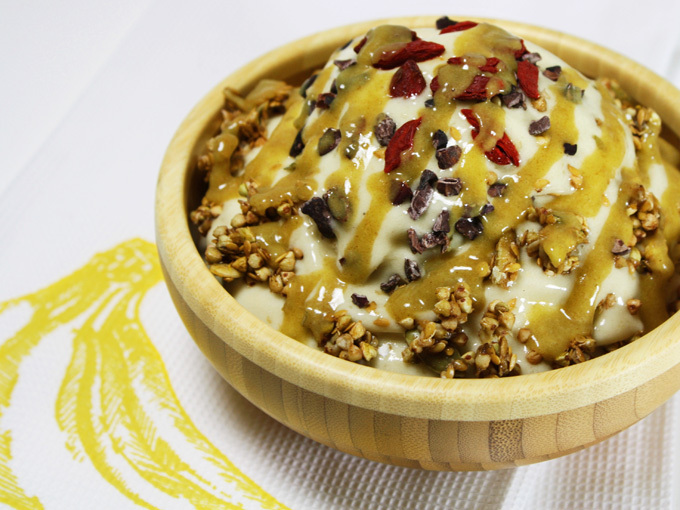 Serve it in a bowl and enjoy as is, or top it with raw vegan granola and/or raw vegan date caramel sauce. Here, I topped it with goji berries, cacao nibs, raw vegan granola and raw vegan date caramel sauce and let’s just say it was heaven in a bowl. I love the crunchy granola with banana ice cream. You know me and crunchiness. Cool yourself off nicely with this tasty nutritious nice cream this summer! Let your bananas fully ripen until the brown spots appear all over. When your bananas are frozen all the way, put some frozen bananas in the blender, and blend until it becomes a smooth creamy texture, like a soft serve. If you have a Vitamix, use the handy dandy tamper to jam the bananas into the blade to help it blend. If you don't have a high speed blender like Vitamix or Blendtec, you can use the food processor instead. But you should cut up the bananas into smaller pieces before you freeze them, to make it easier for the food processor. 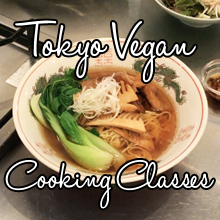 Serve it in a bowl and enjoy as is, or top it with raw vegan granola and/or raw vegan date caramel sauce. Banana bunches ripen all at once, so for some people it can be difficult to eat them all before they go bad. If you want to slow down the ripening process, just separate the bananas. I personally like to dedicate a couple of banana bunches just for freezing, and freeze them all at the same time. That way, you can have it ready anytime for smoothies and banana ice creams.